Signed by Wm. Jackson and Andrew Bunner. The first Continental currency note and first United States government $1 bill. The numbering and first signature in red while the second signature is in black ink. The emblem on the front shows an acanthus plant with a large weighted pot or basket pressing it down, however the acanthus leaves grow up around the pot. Above is the motto: "Depressa resurgit" (Having been pressed down, it rises up again). The nature print on the back contains a ragweed leaf and two willow leaves. Paper contains blue threads and mica flakes. An emission totaling $3,000,000 payable in Spanish milled dollars, or the equivalent in gold or silver, was authorized by the Continental Congress resolution of May 10, 1775 and approved by resolutions of June 23-24 and July 25, 1775 and put into circulation in August. The money, for "The United Colonies", was to be used to pay war expenses and was to be redeemed from taxes collected by the colonies. The paper, made at Ivy Mills in Chester County, Pennsylvania, contained blue fibers and mica flakes and was similar to the type used on Pennsylvania currency. The exception was the unique $20 denomination which was printed on paper made by Benjamin Franklin (thin white paper that had the left side polychromed by marbling). This bill is also a different size from the other denominations. 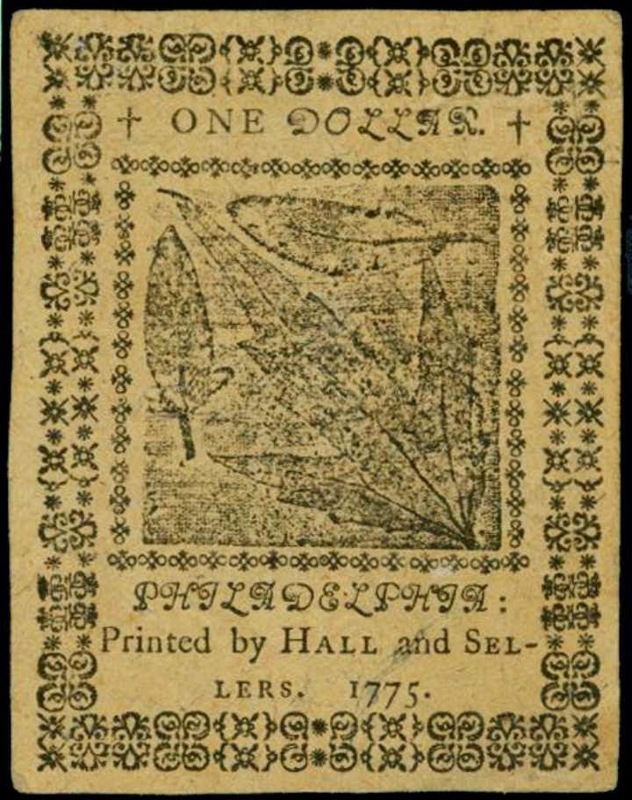 The bills were printed by Hall and Sellers in Philadelphia using border cuts, emblem cuts, nature prints and hand set type. Apparently, thirty six of the borders were designed and cut by David Rittenhouse. The bills were signed with red and brown ink and numbered in dark red ink. Counterfeit detectors were on pink paper except for the $20, which was on blue paper. Denominations printed were the: $1, $2, $3, $4, $5, $6, $7, $8, $20 and $30.